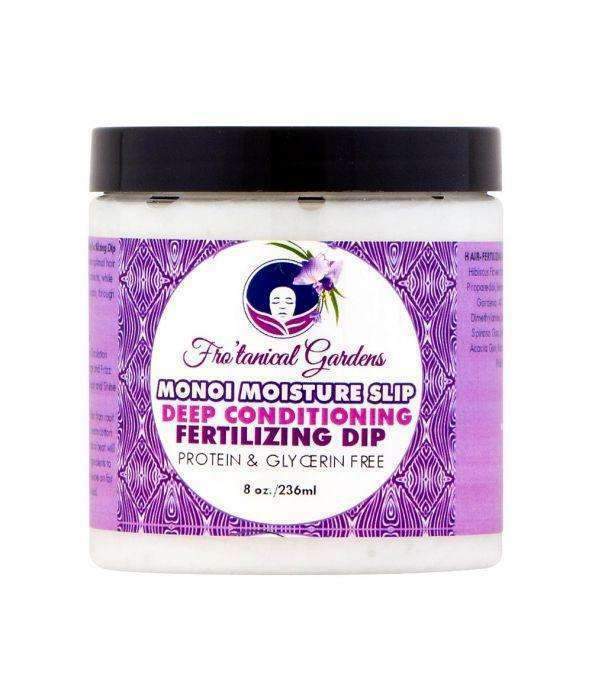 Soultanicals Monoi Moisture Slip- Deep Conditioning, Fertilizing Dip is a natural, deep conditioner designed to provide optimal hair and scalp support with botanical extracts, and nutrients, while also offering moisture, circulation, and damage repair, through advanced actives. Monoi Softens & Locks in Moisture Ginseng Leaf Extract Rejuvenates & Increases Circulation Advanced Moisture Builders to Minimize Breakage and Frizz Nourishes and Protects the Cuticle for Damage Repair and Shine How to Use Apply this Deep Conditioning Fertilizer from root to tip. Cover hair with a plastic cap and place a warm cotton towel over the plastic cap, for best results. The natural heat will penetrate the hair shaft, allowing the botanical ingredients to deeply condition, repair and strengthen the hair. Leave on for 20 minutes or overnight. Rinse & Style as usual. Ingredients Purified Water Botanically Infused with Hibiscus Flower Extract,Ginseng Root Extract, Yerba Mate Leaf Extract, Propanediol, Behentrimonium Methosulfate, Cetyl Alcohol, Monoi Tahitian Gardenia, AKA Tiare, Apricot Kernal Seed Oil, Stearamidopropyl Dimethylamine, Sodium PCA, Rhodiola Rosea root extract, Caesalpinia Spinosa Gum, Senna, Laminaria (Algae) extract, Sodium Hyaluronate, Acacia Gum, Biosaccharide Gum-1, Gluconolactone, Sodium Benzoate, Phlalate-Free Fragrance Oil and Fertile LOVE!